In the quiet wee hours of a NorCal summer night, the ground lurched beneath the mud of the northern San Francisco Bay and sent seismic waves roaring upward and outward into the world-famous wine valley’s central city, Napa, CA. After they wreaked their havoc in Napa and nearby communities the seismic waves spread farther afield and gently rumbled most of the Bay Area and its exurbs from our weekend slumber. By the time they reached Sacramento, the seismic waves were long and churning; houses swayed and doors swung on their hinges for upwards of a minute. This was indeed the Bay Area’s largest earthquake in just about 25 years–the strongest since the 1989 Loma Prieta “World Series” quake–but it was by no mean’s California’s biggest in that time. Since ’89 California has sustained nearly two dozen earthquakes above magnitude 6, although a full half of those were offshore in the coastal waters of Mendocino. Of course, having rocked the heavily populated southwestern quadrant of NorCal, this one will go down as historic. “Did You Feel It?” survey results from the USGS. Distributions of both shaking intensity and population are evident in this map, with stronger shaking skewed to the north and population concentrated to the south. …but I had to get one myself though, right? … one of the principal elements of this earthquake that make it historic is that the fault slip that caused it ruptured to the surface and tore through subdivisions and infrastructure throughout western Napa Valley. California hasn’t seen primary tectonic surface rupture beneath residential structures since the 1992 Landers earthquake, and its occurrence is notable at a time when Alquist-Priolo fault setback zones have emerged as a hot topic in litigious battles over development in Hollywood and elsewhere in L.A.
My officemates were quick on the scene since the earthquake happened practically in Davis’ back yard. (You know, the back yard where we keep all the wine.) They nabbed the research group field truck and were out mapping and measuring offsets within hours of the temblor. I joined them in the field the following day, and had an amazing time documenting offsets and damage, and holding discussions with residents, media, and other workers. Collectively these observations and discussions provide insight into every facet of the earthquake phenomenon, from source processes along the fault to coseismic shaking effects to community recovery, response, and resilience. Below are some of the key sights from that expedition. Chad Trexler and Alex Morelan mark the highway mile where the earthquake rupture crosses and offsets State Road 12 heading into Napa Valley. The rupture unzipped along the West Napa fault, and propagated onto a previously unrecognized branch of the fault that runs directly through the Napa neighborhood of Browns Valley. It’s in this subdivision where slip along the fault buckled roads and sidewalks so famously in that quintessentially Californian scene of skateboarders and bmxers tearing up the torn up streets. This buckling is ubiquitous where the fault line snakes through the neighborhood, and is expected even with pure strike-slip fault motion (i.e., with no net convergence across the fault but purely lateral slip) where streets and sidewalks cross the shear zone obliquely. With the fault striking from my vantage point toward that mailbox in the center, motion of the right side toward me and the left side away from me results in convergent deformation along the seams in the infrastructure which are oblique to fault motion. The fault is essentially creating a seismic moletrack through pavement. From the other side. Note homeowners living in RV because of damage to house. In between offsetting streets, the fault rips beneath the intervening residential properties, warping driveways and wreaking havoc in the homes above. Even with a mere 10 – 20 cm of shear offset, houses along the fault trace have sustained structurally compromising distortions. The fault passes just inside the garage door, out through the middle of the back of this house, and extends up into the foreground beneath my feet. Inside, we see how right lateral shear works in a more intuitive medium: hard wood flooring. Because this house is built on piers rather than on a concrete slab, the shear deformation imparted by the fault follows a discrete path through the structure directly above the tectonic shift below. Right-lateral shear of a hard wood floor. The far side of the room rests on the east side of the Browns Valley West Napa fault; I stand on the west side. In addition to shear deformation of relatively few structures, the entire neighborhood sustained pretty extreme ground motions. Sporadic evidence of accelerations exceeding g catch your eye around the neighborhood, such as these concrete sidewalk pavers that have been thrown upright by more than simple net compression across the fault, exposing the graded bed below. Perhaps a combination of tectonic deformation and ground motions, the propping of this sidewalk block cannot be explained by tectonically driven compression alone. Imagine the ground motions necessary to loft sidewalk pavers. The other notable feature of this surface rupture was the high proportion of afterslip, at least in places. Repeated field measurements, delayed subterranean infrastructure damage, and anecdotal reports of growing cracks all attest to the growth of slip along the fault in the 36 hours following the initial rupture. For example water lines beneath the parking lot of Stone Bridge Elementary School broke during the night after the earthquake, August 25, while an extra 4-5 cm of slip accumulated as measured/re-measured by Chad and Alex. Teachers at the school reported buckling of the parking lot pavement that they had not observed following the earthquake. En-echelon shear cracks in the pavement are visible leading towards a ruptured water line at Stone Brook School, where afterslip resulted in unanticipated additional damage following the main quake and rupture. The left-stepping alignment of these en-echelon fissures represents a classic signature of right-lateral shear. Why are there things on this fault? Google Earth screen cap of Quaternary faults in Napa Valley overlaid with Sunday’s earthquake rupture in red. Yellow faults are Late Quaternary in age; Blue are older. In the north the answer is simple: the fault was simply not mapped. Nobody had identified it topographically, and researchers had not yet been granted the funds/time to go investigate and try to find it. This is the portion that extends beneath the Browns Valley subdivision, so grading for residential construction had obscured any surface trace of the fault anyway. In the south the fault was mapped; in fact, south of State Road 12 the causative fault was easily identifiable by a beautiful–if ominous–geomorphic scarp extending through rows of vineyards. The rupture of this earthquake lines up precisely along the center of this scarp, exactly where scientists expect it to be. That’s a big and rewarding success. Alex Morelan stands on a road that drops down the West Napa fault scarp. The topographic step down from left to right across the fence behind him represents the cumulative displacement of many many earthquakes. Sunday morning’s quake ripped right along this fault, adding to the offset and tearing across this rapidly mended road. So the fault here was mapped–why then is that school sitting right atop its trace? The Alquist-Priolo Special Studies Zone Act applies to Holocene faults, those active in the last 11,000 years. To be deemed Holocene, faults must have demonstrably offset something of Holocene age. According to the USGS Quaternary Faults Database, this strand of the West Napa fault is listed as Late Quaternary in age, meaning only that it can be demonstrated to have slipped in the last 130,000 years, but not necessarily in the last 11,000. Now that this earthquake has revealed the fault through this area, scientists from the California Geological Survey and the USGS will be adding it to the Quaternary fault database, and because of now indisputable Holocene surface rupture, I suspect it will be quickly designated as an Alquist-Priolo special study zone. Because of the relatively small magnitude of this surface rupturing earthquake (usually we expect surface rupture to result only from earthquakes larger than ~M6.5, although rarely, as in this case, the slip in a smaller quake reaches the surface), the amount of surface displacement is quite small. That’s good news for the unfortunate homeowners along the fault, whose situations could have been life-threatening with larger coseismic displacement. Compare these ruptures to the 2 – 4 m of slip observed in Baja, 2010, or any number of other M~7 earthquakes around the world, in which surface slip regularly exceeds three meters. Despite heavy losses to local businesses and wineries, and the destruction of many people’s homes’ contents, we collectively dodged a bullet with this modest–but significant–earthquake. Localized heavy damage and violent shaking struck a harsh blow to the small town of Napa, but it has opened the eyes of the region as a sharp reminder that these events can happen at any moment. We can thank existing knowledge for the building codes that kept this from being an utter catastrophe, and we can thank the earthquake itself for shedding more light on the specific locations of faults and the nature of shaking in the Bay Area. I’ll leave you with the rupture’s most impressive accomplishments. These are near the maximum measured offset, and present some classic scenes for illustrating right-lateral strike-slip deformation. Feel free to ask questions, leave comments, or correct my flagrant misinterpretations of structural damage and extreme ground motion signatures. There are other great posts summarizing different facets of this earthquake including its regional context by Chris Rowan, and an incredibly thorough summary of pretty much all facets of it by Mika McKinnon over at i09. Thanks. Great coverage of the happening! Super loving this coverage from the Davis group. Thanks very much Austin et al. Thanks for this informative article— and for confirming a guess of mine. 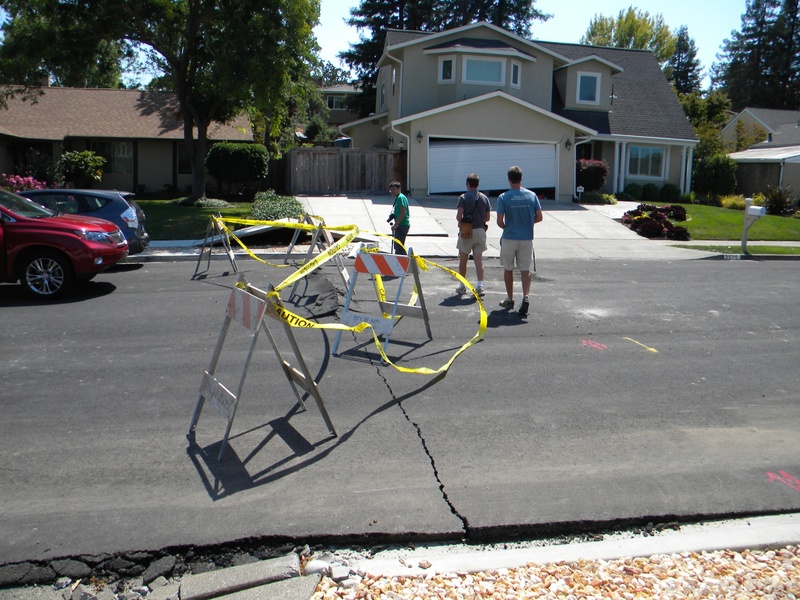 From the first moment I saw that long crack in the neighborhood, I wondered if it was the surface feature of the fault. Thanks! Great information and pictures I hadn’t seen. I live in Martinez, 17 miles away and my apartment shook as if a giantbdog had it in its mouth. Odlly some people I talked to slept right through it. I posted 5 videos about it on You Tube, 2 on the quake and the 3.9 aftershock & 3 where I went to downtown Napa and showed damafes to buildings within a 3 block radius. I’m going to return to do one more video this week. 14 businesses red tagged in that 3 block area and 2 houses that I saw as well one with both chimneys off. A winery store, office building block and dentist’s office building effectively destroyed as well as the damaged courthouse and a movie theater. I post on You Tube as The Guy From Pittsburgh ( tm ). Out of curiosity, how do you put the copyright notice on your photos ? I took some still photos too but need to finish the roll up & get them processed. Great site and will publish a link to it on my forum and blog as well. If you mean the copyright watermark, you can use GIMP for that kind of stuff, if you really must. Great coverage. Having an interest in Geology (Cal ’89) I am always looking at topography as a way to interpret past events. 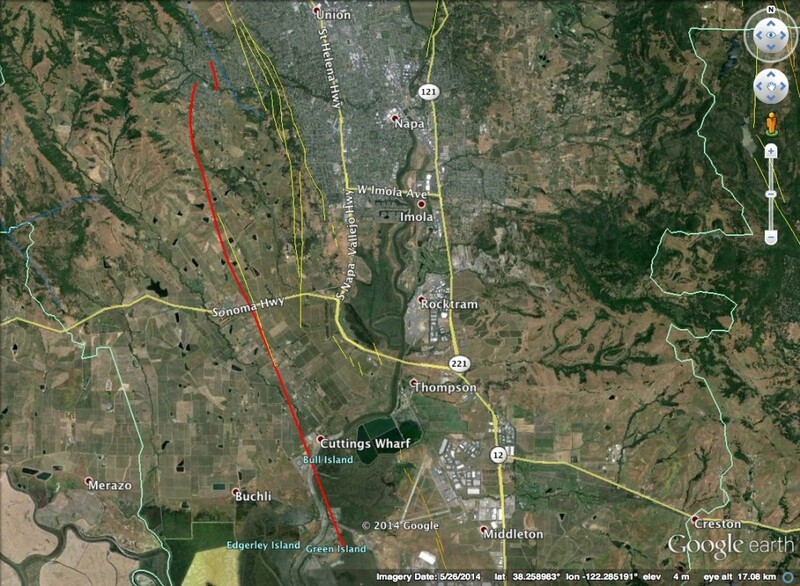 I must admit that I missed the obvious fault scarp south of Hwy 12 in my 40 years living in Napa. I even have vineyard clients in that area (I am a viticulturist by trade). I look forward to more info on this event. Cheers. As always, great summary, Austin! I was intrigued by your section about “Why are there things on the fault?”. I agree that, funding and time for fault mapping obviously led to incomplete mapping of this fault trace. After walking all over the fault rupture trace, what is your feeling about the possibility that portions of the rupture trace would not have been identified by well-funded geologists, either due to geomorphic features (scarps) not being preserved from previous/recent earthquakes, or because the 2014 trace actually ruptured “new” stretches of fault?? All faults, or portions thereof, have to initiate at some point….any chance that this is the case, say, near the northern third of the main/long fault trace on your GE map? Yes, you’ve identified two alternatives for the previously unidentified fault: 1) the fault could have been mapped with closer scrutiny/more funding, or 2) the fault would NOT have been apparent to investigators. New investigations with lidar data (including forthcoming post-event scans) should reveal scarps that may not have been previously identified for lack of geomorphological attention. In the Browns Valley subdivision, however, we’ll need subsurface methods to identify any preexisting fault trace. That neighborhood covers the northern 3rd of the fault was graded and built in the 1960s, so even if there were paleoseismic scarps there, they had been bulldozed a decade before Alquist-Priolo. They wouldn’t/won’t be apparent in any surface imagery/measurements. I thought the fault was discovered too recently for people to know better and not build anything on it. I mean, yeah, some structures might be newer, but we got a lot of old buildings here in Napa.